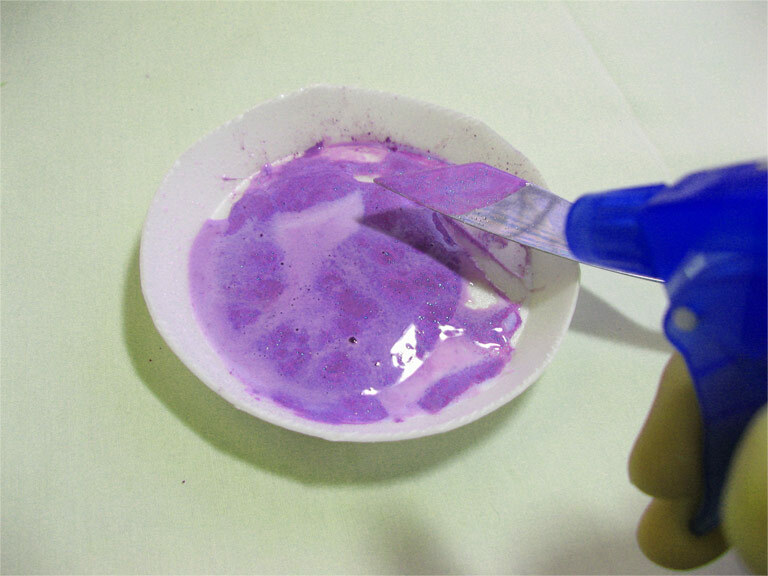 With your paint mixed to the consistency of whole milk. It is now time to apply it to the canvas. 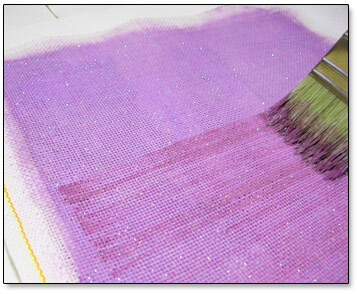 Refer to “Painting Lavender Glitter Canvas – Part 1” if you missed it. First, lay your plain white canvas and spray it with a fine mist of water. Turn it over and spray the back side too. Spray just enough to feel the canvas go limp. 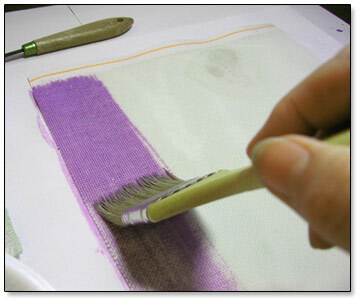 This will help break the sizing and allow the paint to penetrate between the fibers of the canvas threads a bit better. 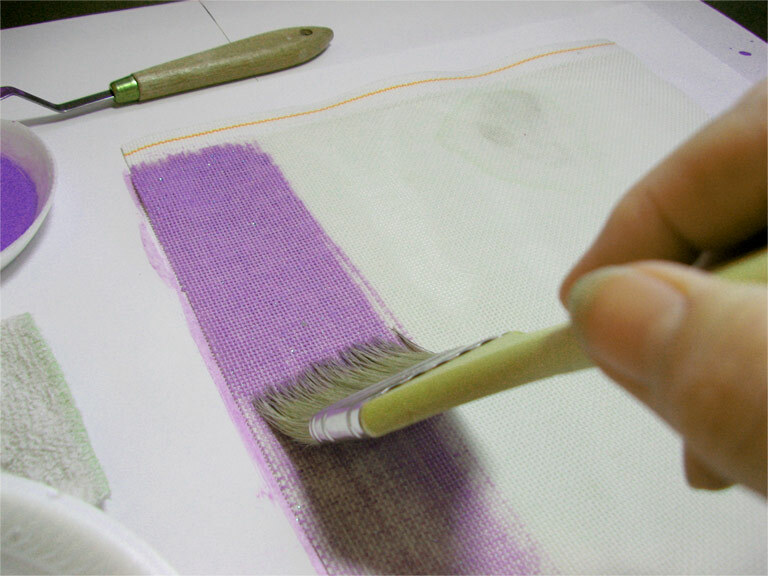 Note 3: Painting the canvas is just a “coating”, the fibers of the canvas threads are not going to take up the paint like in a dyeing process. This sort of paint wash is very permanent, but not completely penetrating. If you plan to do pulled thread stitches, there will be tiny white dots that reveal themselves when the canvas threads are distorted. 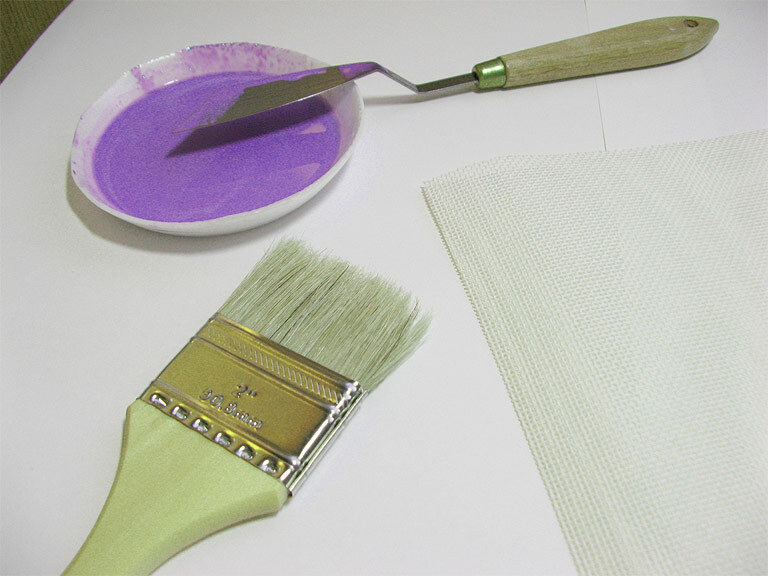 Use a wide, stiff bristle painters brush to paint the wash on the canvas. Load the brush half way with paint, and allow the excess to drip back into the container by dragging the brush across the edge. 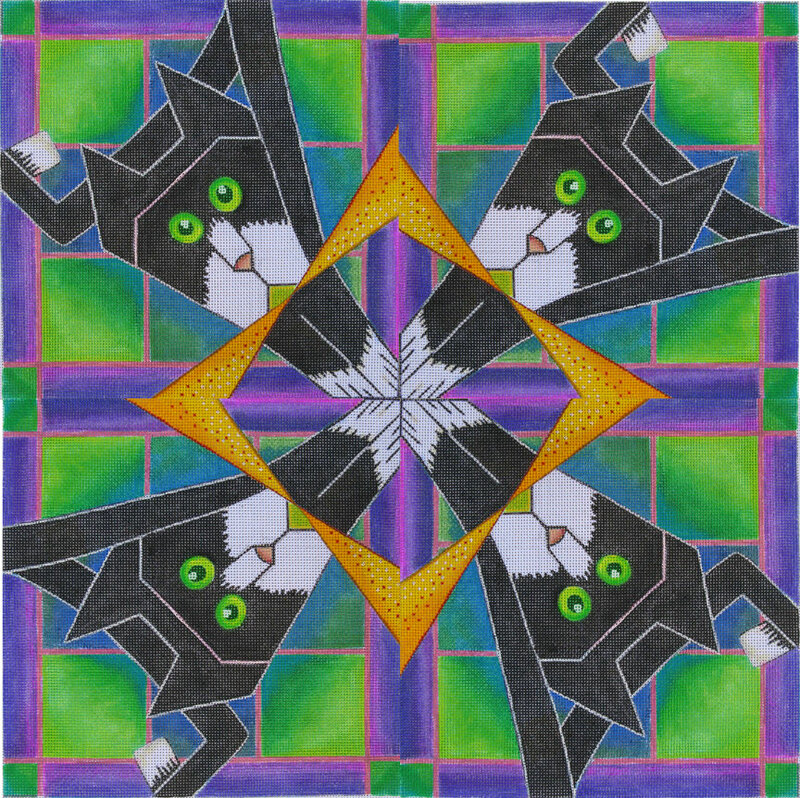 Apply in strokes that are parallel to each other, and overlapping slightly. 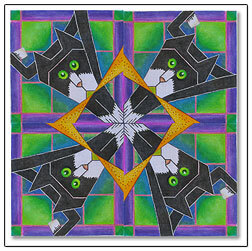 Rotate your canvas, and apply a layer of cross strokes. Repeat this one more time and the canvas should be close to covered. If there are any areas that look a bit thin, apply small amounts of paint and “scrub” the canvas with the brush in an upright position. 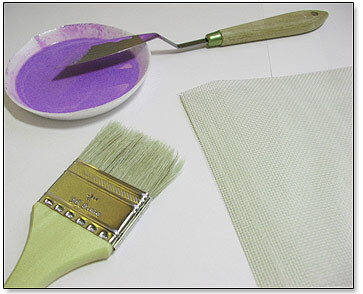 This will also help dislodge some of the paint tension that may develop in the canvas holes. 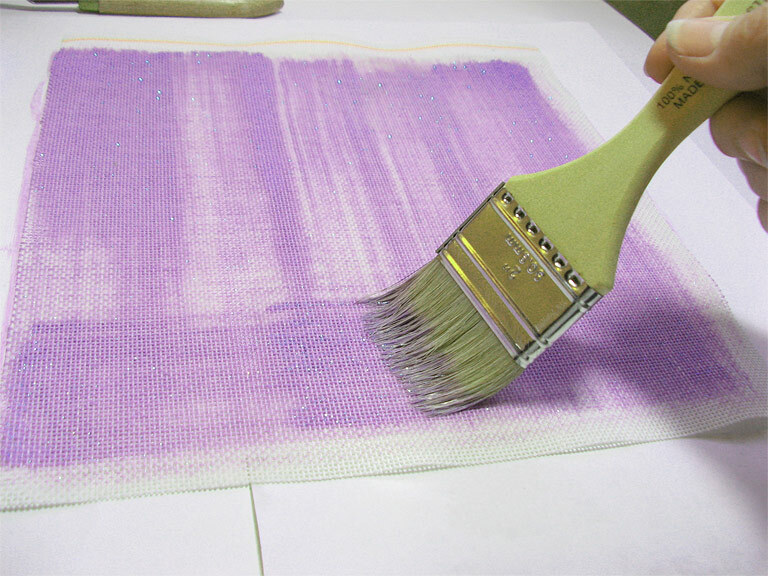 Once the surface of the canvas looks even, turn the canvas over to the backside and blot with the terry cloth towel to remove the final excess paint. Hold the canvas up and check for filled holes. There should be very few, but if there are some, try blowing through the canvas to break them. Side Note: When I mixed the paint for this sample canvas, I did not mix enough. I decided to add a second set of paint layers to strengthen the color. Notice the application of a darker color value below. Just for the heck of it, I left some of the striations on the finished canvas. Let the canvas dry. Iron with a dedicated craft iron (not your good one) on the cotton setting. Iron both the back and the front of the painted canvas allowing for a 3-second hold before moving to the next spot. Congratulations – Custom colored canvas awaits your imagination! As I prepared my canvas for the CyberPointers Stitch-A-Long (SAL) – Midnight Garden project, I took a few pictures to share with you. 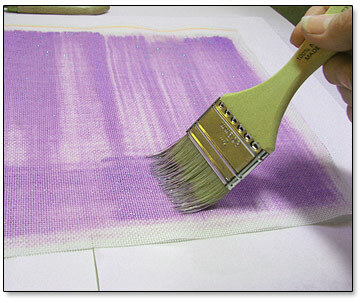 This is a tutorial for painting a canvas with a tint or wash of color. It is an excellent way to distinguish, and customize your project when you use stitches that intentionally expose the canvas threads. 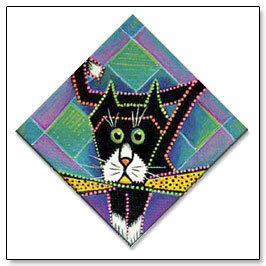 The process is not difficult, and not very expensive if you already have some acrylic paint supplies on hand. 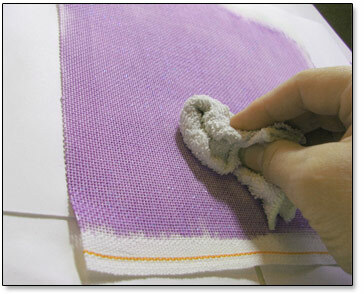 The results will be quite suitable for most projects, and mistakes can be used for projects that fully cover the canvas with stitches. For certain specific designs, I personally use an airbrush to achieve more controlled color transitions or stenciled edges. 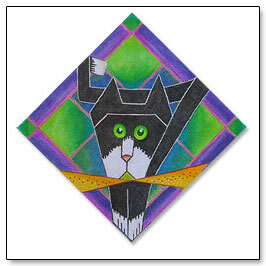 And for detail work, I would hand render the illustration on canvas. Now, lets get started . . . 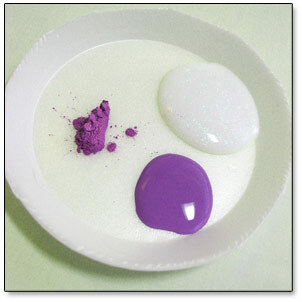 Above you see a squeeze of paint, a puddle of gel medium (with sparkle glitter already mixed in) and a dollop of Pearl-X powder. 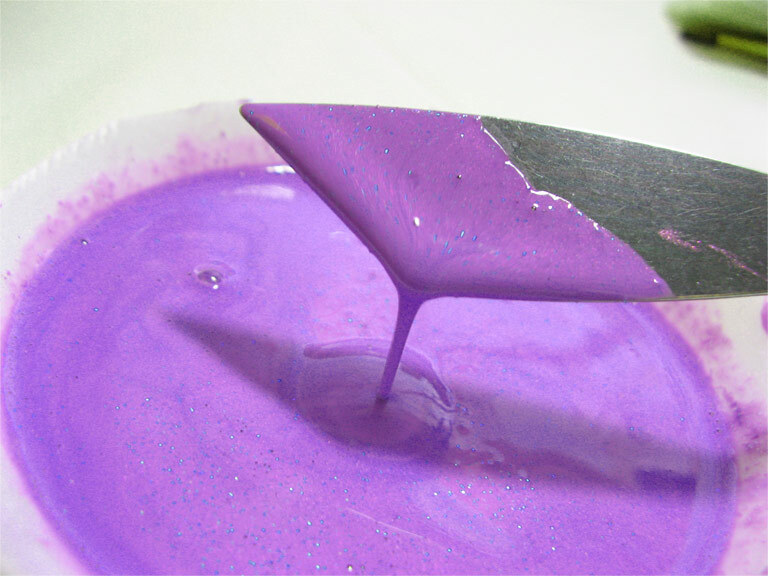 The mixture needs at least equal parts paint and gel, but sometimes the less costly paints have less pigment, so more paint may be necessary. I added the Pearl-X powder as an effect. The result: absolutely NO effect at all. 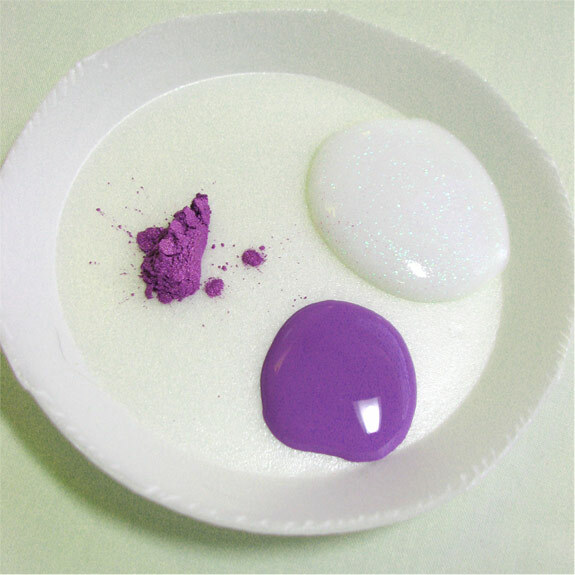 On the other hand, the glitter gel was exactly the thing to make sparkles galore. Note 1: This glitter gel was on sale, normally I would have used plain liquid gel or textile medium and added glitter sparkles directly into the mixture. Note 2: The amount of paint mixed was not enough to cover my 10 x 10 inch canvas to my satisfaction. As you will see in Part 2 of the tutorial, I mixed some additional paint to finish the job. 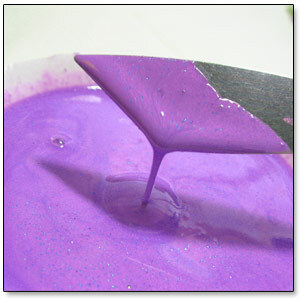 Be sure to mix enough paint especially if mixing two or more paint colors to get the hue you want. It is hard to get an exact match the second time around. Mix the ingredients with the palette knife. Use a sideways motion to scoop the mix together, then flatten the blade of the knife on top of the pile to squeeze it. 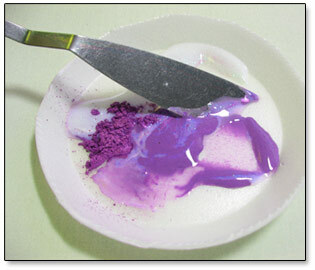 Repeat the scoop and flatten method until it is very consistent in color and texture. So far, we have not added any water to the mix, but now is the time to begin to loosen it with water. 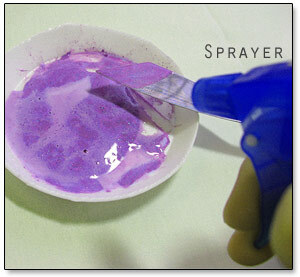 Use the spray mister, set on fine mist, to add water. Give one spritz at a time and then mix with the palette knife. Our first target consistency is like very heavy cream. 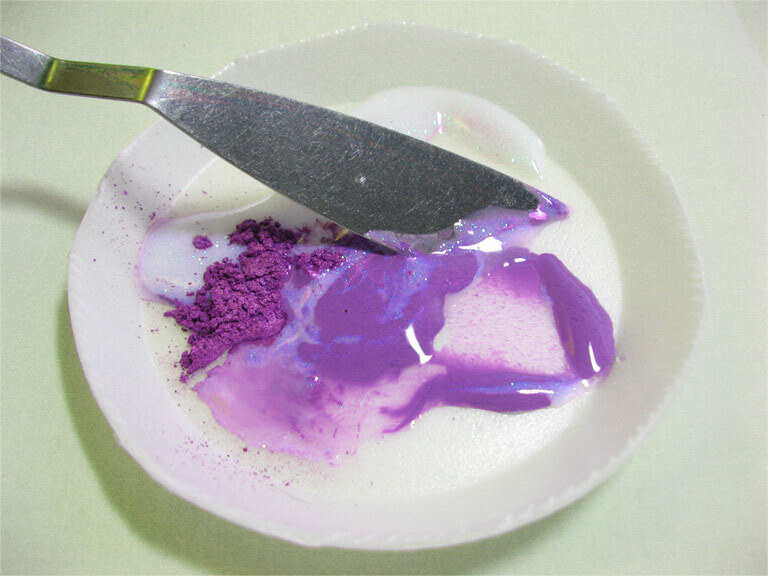 The consistency shown above is well mixed with no trace of paint flecks, and can be tested by looking for a solid, thin stream of paint coming off the palette knife. One more addition of water is need to thin the consistency to a milk-like thickness – that would be whole milk, not low fat. If your mixing palette is too shallow, now is the time to pour the paint into the wide mouth container, and add a little water at a time. Proceed to part 2 . . .